Food supplement based on Berberis aristata (Berberin 500 mg), red rice fermented (monacolin K 3 mg) from Monascus Purpureus, coenzyme Q10, chrome and folic acid. 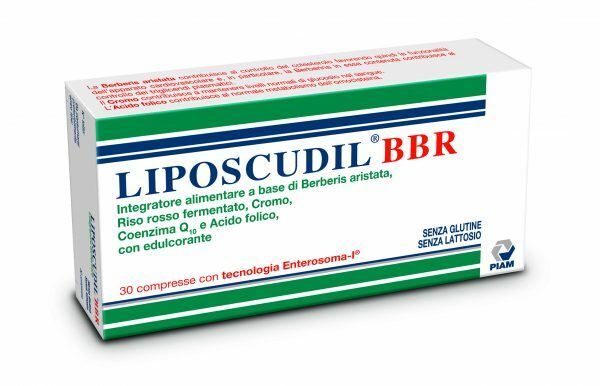 Liposcudil BBR is useful to promote the control of blood cholesterol levels, triglyceride levels and glycemia, thank to Berberis aristata, Berberin and chrome. Berberis aristata helps control the blood cholesterol levels, and thus the correct functioning of cardiovascular system; in particular Berberin, which is contained in Berberis artistata, helps control blood triglyceride levels. Chrome is useful in manteining blood sugar levels, while folic acid helps homocysteine to be metabolized correctly. Liposcudil BBR contains an innovative pharmaceutical patented technology, the ENTEROSOME-I, which increases the bioavailability of all the ingredients. In particular, Berberine is poorly absorbed by the human gut: the Enterosome-I is important to increase absorption of Berberine.